Last month, I shared some in-process pictures and musings on teaching my mom to quilt, mostly in my newsletter and on Instagram. Typically (but not always), it's the other way around; my mom would be teaching ME to quilt. 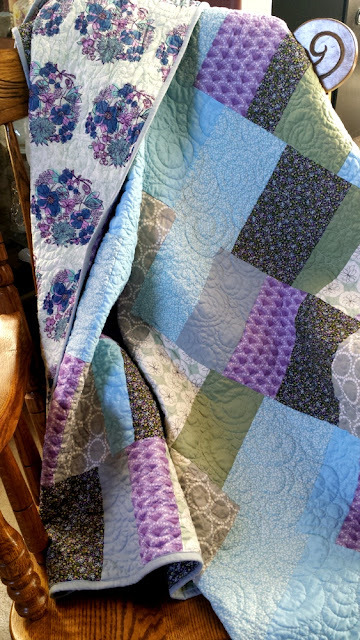 My grandmother hand-quilted a bit in her youth, but I'm the first serious quilter in the family, as far as I know! One of my favorite pictures of us. Anyway, Mom has a special friend from childhood, and she wanted to make her a unique birthday gift. 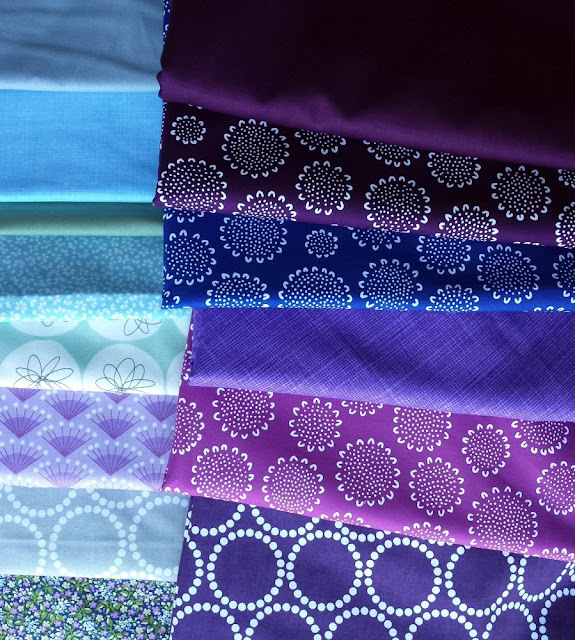 We sat down to choose fabrics, which I shared here. Mom picked the fabrics on the left for this quilt, because her friend loves a tone-downed palette. We're still planning on combining the scraps from these two stacks to make a wall-hanging. They weren't supposed to go so well together, but they really do! Then, over the course of about a week, I led her through the process of making a quilt. I've come to the conclusion that it TOTALLY makes sense to teach beginning quilters how to improvise. Instead of piecing blocks and matching points (which you can learn later), it makes sense to first learn the process of creating a whole quilt and trust your gut. This is more for another entirely different post, but the point is this: I tested out one of my basic improv patterns on her, and it worked! Things got silly after a while. It was gratifying, though, to see someone else enjoying the hum of the sewing machine for a few hours. Then, I showed Mom how to baste a quilt (all the while blasting the Hamilton soundtrack on my phone. Just setting the scene here). I explained all the different ways to baste that I know of. Mom was interested to hear about the wonders of spray baste and my own process (which is based on much trial and error - I'll have to share on here in the future). She didn't do the basting herself because she just had two knee surgeries. I was happy to help. 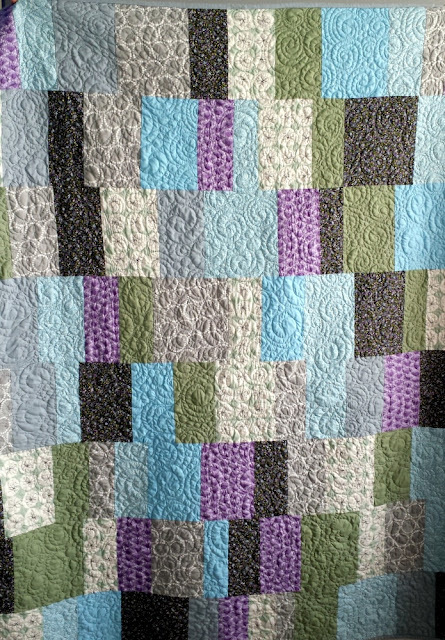 Mom wanted this quilt to be quilted densely. After I presented several different options, she chose swirls with pebbles, which recalls shells on the beach (which her friend LOVES!). If you want to learn how do quilt this way, check out the Seafoam motif in Free-Motion Quilting With Angela Walters. In the interest of time, instead of teaching her to confidently free motion quilt (which would take at least 15 hours of practice! ), I quilted it for her on my Janome. She's interested in learning in the future, though. I hadn't quilted an all-over motif in quite a while, and it took several hours to quilt a 55"x62" quilt like this! I was absolutely exhausted over the three days I worked on it, but the outcome was worth it. I will forever insist that quilting IS exercise and that it should probably be an Olympic sport. 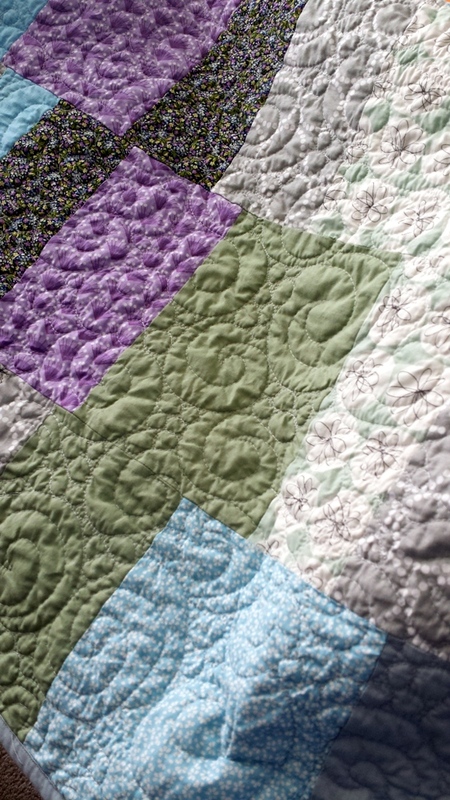 I quilted over this soft palette using my favorite gray, Aurifil #2600 (Dove). All in all, it was an educational process for both of us. Mom learned a ton about quilts - she says she didn't realize how much thought and work really went into each one. I realized how much I actually KNOW about making a quilt and how specialized a process it can be. It's a skill that can be learned and practiced, and we should certainly appreciate and place significant value our time and expertise. 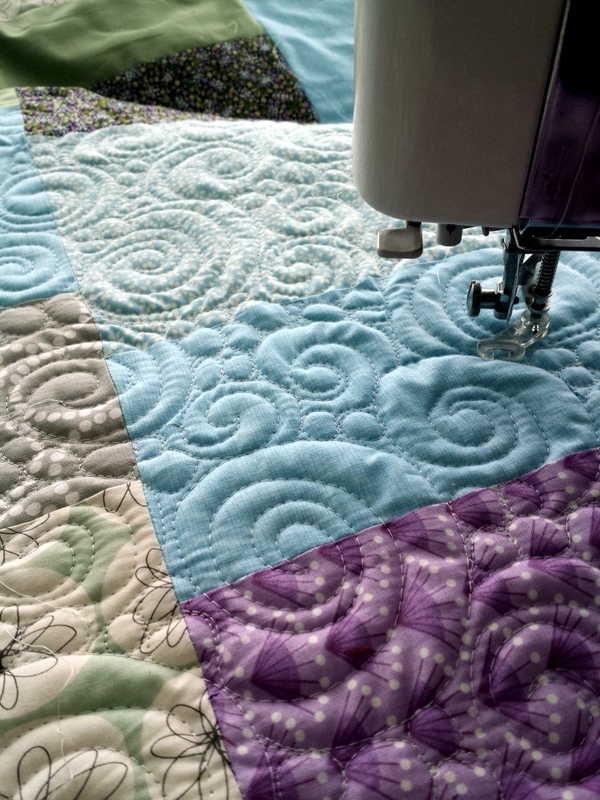 If you're an experienced quilter, please don't underestimate your skills! I had the opportunity to use up some long-owned Art Gallery yardage on the back. Boom. Oh, and my mom's friend LOVED it. It was the best feeling to receive this picture and a thank you note from her! 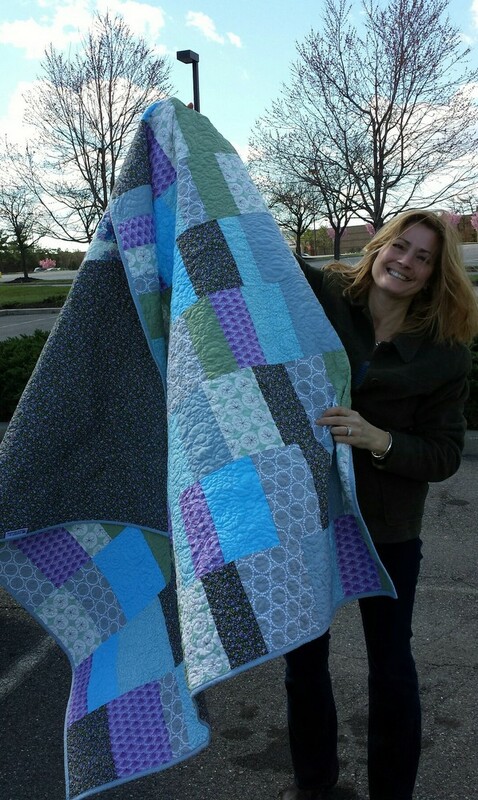 Gifting quilts FTW. This quilt is beautiful! 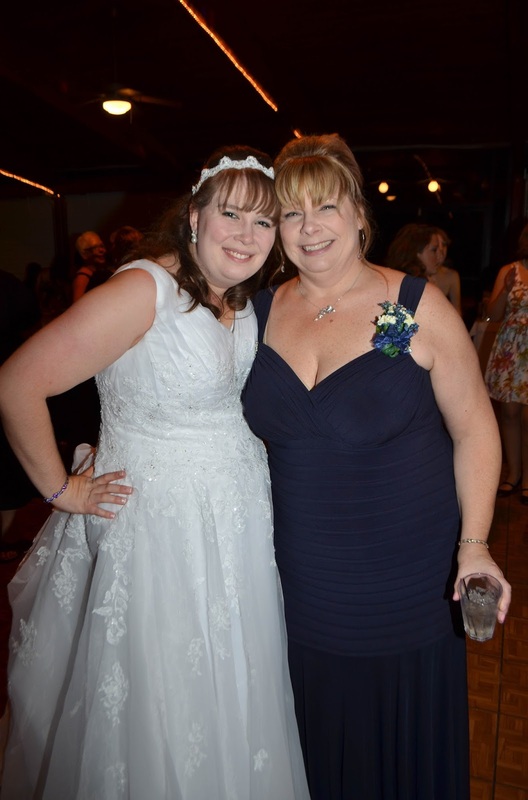 Kudos to your mom for tackling something new and to you for teaching her! Aww what a great gift!! She obviously loves it! Has your mom started planning the next quilt? Such a fun story and the quilt is beautiful! I so enjoyed reading this post... Lovely to have mum/daughter tine doing something like this together! And, a lovely finish! As i sit here recovering from knee replacement surgery myself, and prepping for iur daughter Jessica's wedding, your post brought huge smiles to my face! Your mom evidently enjoyed the process and i'll bet you have a new quilty cohort in the family now! How wonderful to read about mom and daughter getting along so well and creating such a gorgeous piece of artwork that doubles as a snuggle-bunny !~! I love the pattern too-it's the same method I use for many of my quilts; shows off the fabric and no finicky points to contend with. 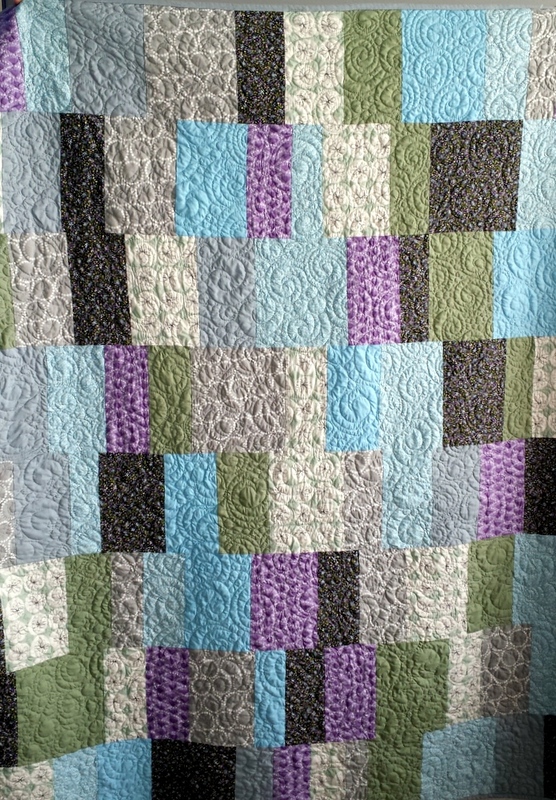 A beginner friendly kind of quilt. 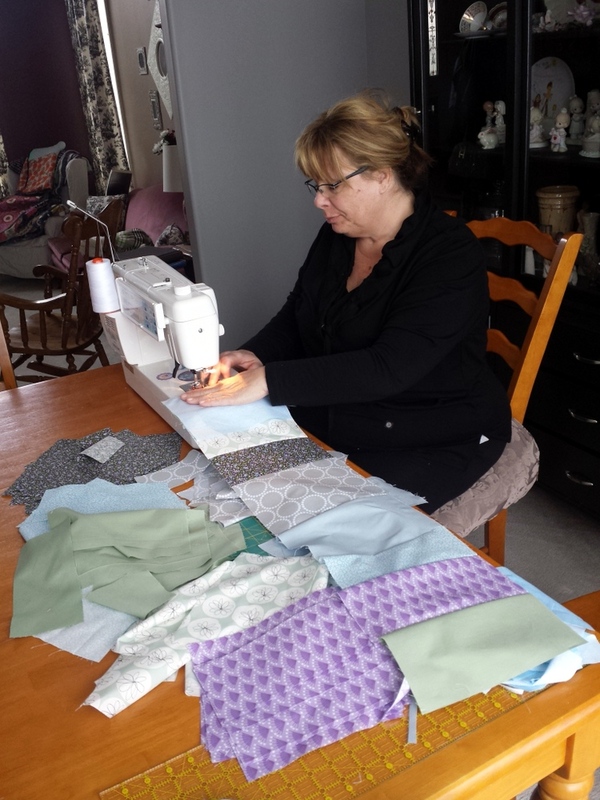 Sharing a mother/daughter quilt story...my girl does not sew or quilt, but she once rented a car when I was visiting so she could take me out of state to check out fabrics for my own quilting. She knows so much about me. That was about HER. Janel Barthe, Metairie, LA. What a lovely experience to share with your mum! What a great experience and a lovely quilt! Thanks for sharing with TGIFF! 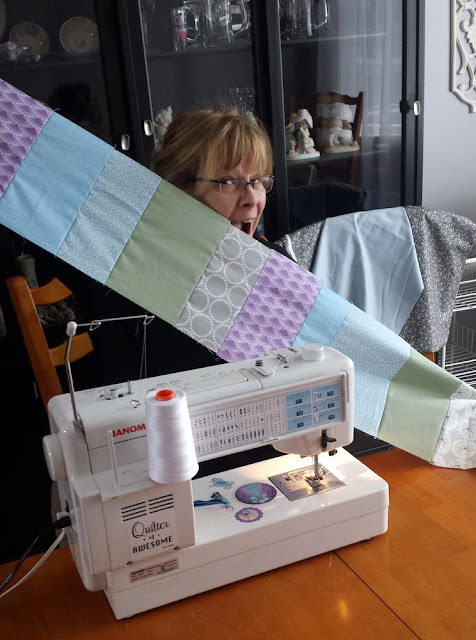 Love this, how great to quilt with your mom! I totally agree re. Starting with improv. I think it can really build confidence. I still consider myself a beginner--or a forever learner--and I've seen my precision improve with time. 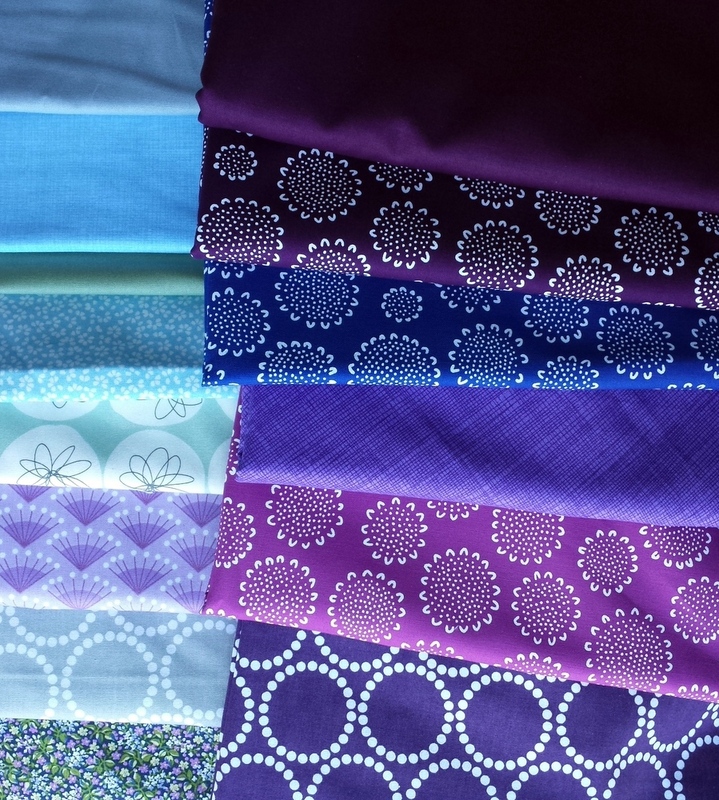 If I was worrying about a perfect 1/4in seam I wouldn't have created half the quilts I've made.